What makes this recipe so “quick and easy” is that the dough is yeast-less and requires no rising time. Once the dough is made, it’s just minutes to toast the crust and then add the toppings. It’s truly delicious and can be extremely healthy when adding super nutritious veggies to the mix! Mix dry ingredients. Add 3/4 cup water and oil. Stir until it forms a ball. If dough is stiff, add more water. The dough will be soft, not sticky. Knead on a floured surface for 3-4 minutes. To "Rice" the Cauliflower: Take 1 large head of fresh cauliflower, remove stems and leaves, and chop the florets into chunks. Add to food processor and pulse until it looks like grain. Do not over-do pulse or you will puree it. (If you don't have a food processor, you can grate the whole head with a cheese grater). Place the riced cauliflower into a microwave safe bowl and microwave for 8 minutes (some microwaves are more powerful than others, so you may need to reduce this cooking time). There is no need to add water, as the natural moisture in the cauliflower is enough to cook itself. Decorate your pizza however you desire! 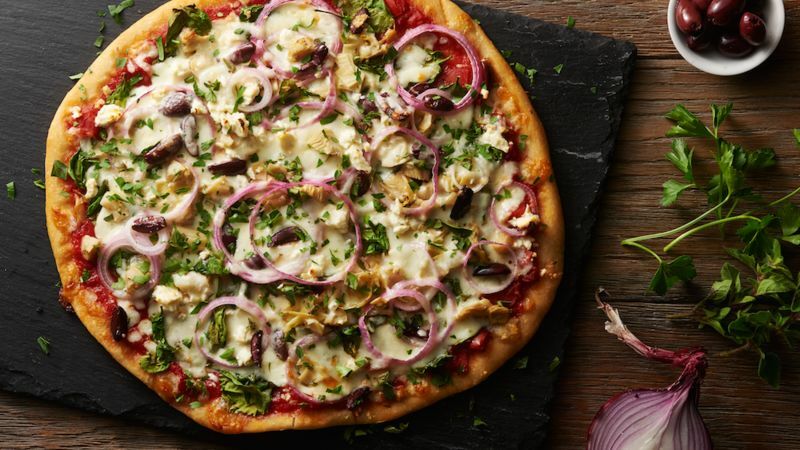 This image is Greek-style with onions, artichokes and olives.